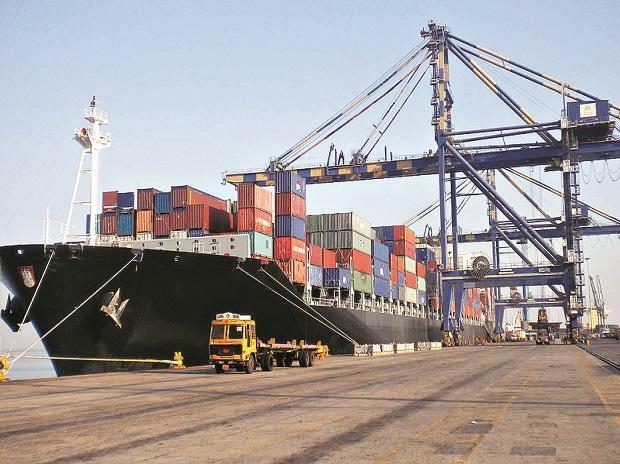 According to data released by the commerce and industry ministry on Monday, exports stood at $32.55 billion in March, taking the total tally in 2018-19 to $331 billion. 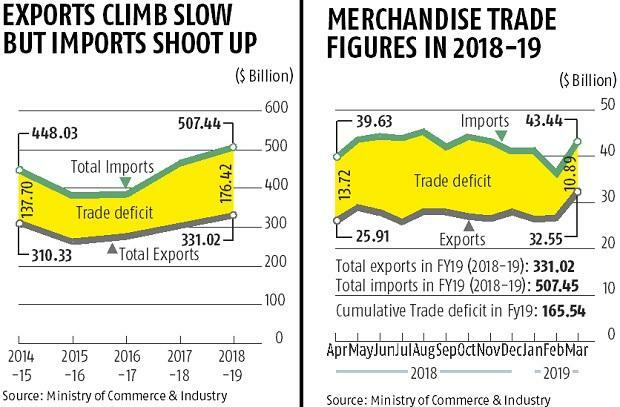 While it is the first time that outbound trade has remained above $300 billion for two consecutive years, exports couldn't cross the government’s internal target of $350 billion. In the 2017-18 financial year, exports stood at $303.52 billion. New orders in key foreign exchange earning sectors such as gems and jewellery, engineering goods, and petrochemicals, meant export growth reached double-digit figures for the first time since October. March’s 11 per cent follows four straight months of low growth with export receipts rising by just 2.44 per cent in February. Of the 30 major product groups, 20 recorded a growth in March, up from 18 in February. Among the growth pullers, engineering goods rose by 16.2 per cent, after remaining sluggish after the marginal rise of 1.7 per cent in February. “The prospects look very challenging going forward, as cautioned by the IMF, the RBI and other agencies,” Engineering Export Promotion Council India Chairman Ravi Sehgal warned. The sector accounts for nearly one-fourth of the total foreign exchange earned through exports, and EEPC has suggested a strategic shift in export of particular products to improve growth. Readymade garments, the sector in which India’s export competitiveness has steadily fallen over the past financial year, showed signs of steady recovery with $1.71 billion worth of merchandise exported in March. Growth was up by more than 15 per cent in March after the 7.1 per cent growth in the previous month. However, drugs and pharmaceuticals exports went down in March with 13.59 per cent growth, down from the 16.11 per cent growth in February. However, gems and jewellery also continued to contract. Periodically falling into the negative zone in November, the $3.42 billion worth of exports in the sector contracted by 0.37 per cent in March. However, the pace of contraction has reduced steadily with contraction registering at 2.1 per cent in February. The pace of exports has been hit in the sector, as fund availability dried up in the aftermath of the fraud reported by Punjab National Bank by diamond merchant Nirav Modi. Receipts from the volatile processed petroleum exports rose by 6.55 per cent in March, up from the 7.7 per cent decline in February. While declining oil prices have marred the chances of earning the same dollars through exports in recent months, it has helped India save foreign exchange through a slowdown in imports. The largest component of the import bill — crude oil — saw the cost of inbound shipments rise by 5.5 per cent, following the 8 per cent decline in February. While global crude prices had started reducing from early November and a supply glut was expected to remain till the middle of the year, prices have started rising again. Gold, the second-largest component of the import bill, saw a sharp rise of 31.2 per cent to $3.27 billion. Imports of the metal had fallen by 10.81 per cent in February after a 38 per cent growth in January. The industry continues to see volatility as imports had risen in July after remaining in negative territory for six months. However, total import growth stood at a mild 1.44 per cent. The country had seen a 5.4 per cent decline in imports in the previous month of February. As a result, the monthly trade deficit came in at $10.89 billion in March, higher than $9.59 billion in February. Non-oil, non-gold imports, a sign of domestic industrial demand, remain depressed in March, contracting by 2.67 per cent. It had contracted by 3.72 per cent in February.